Since companies are in some stage of finalizing their 2019 budget, this month’s video should help you with projecting your company’s 2019 energy costs. Since companies are in some stage of finalizing their 2019 budget, this month’s video should help you with projecting your company’s 2019 energy costs. If your company is budget sensitive, you need to look at the product type of your energy supply agreements. 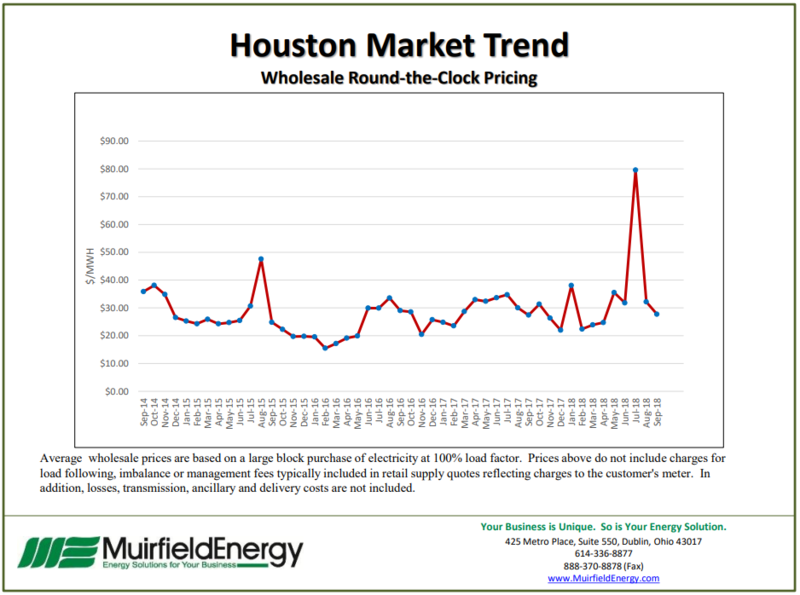 If you are in a natural gas variable rate supply agreement, even though you anticipate that your usage may not fluctuate much in 2019, with the variable rates supply agreement, coupled the volatile energy market, which at the moment is on an upward trajectory, your budget projections will potentially need to be increased. Depending on certain factors, your company may have more budget certainty on a fixed rate product versus a variable rate product. You also need to look at the expiration date of your supply agreements. If your supply agreements are floating month to month, or are expiring within the next year, more specifically between now and April of 2019, you need to speak to your energy advisor about renewal pricing at this time. 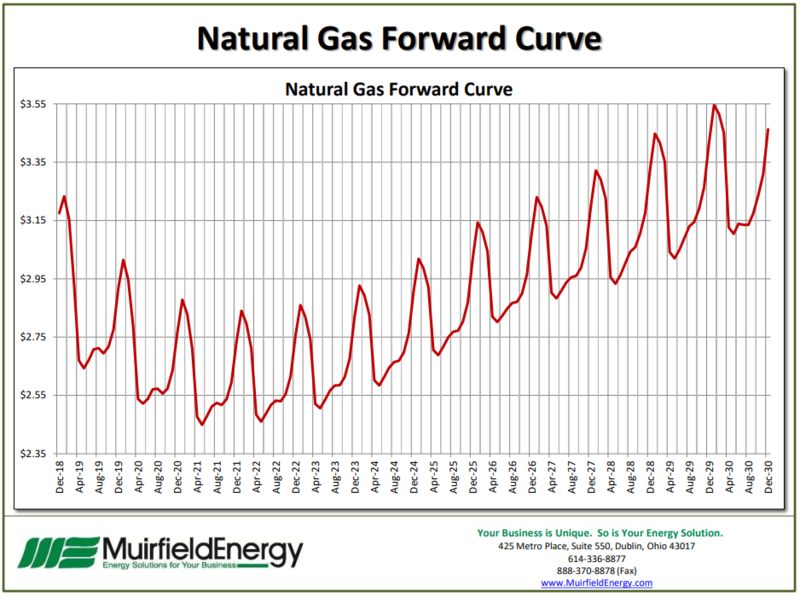 Natural gas storage levels also continue to be a cause for concern. 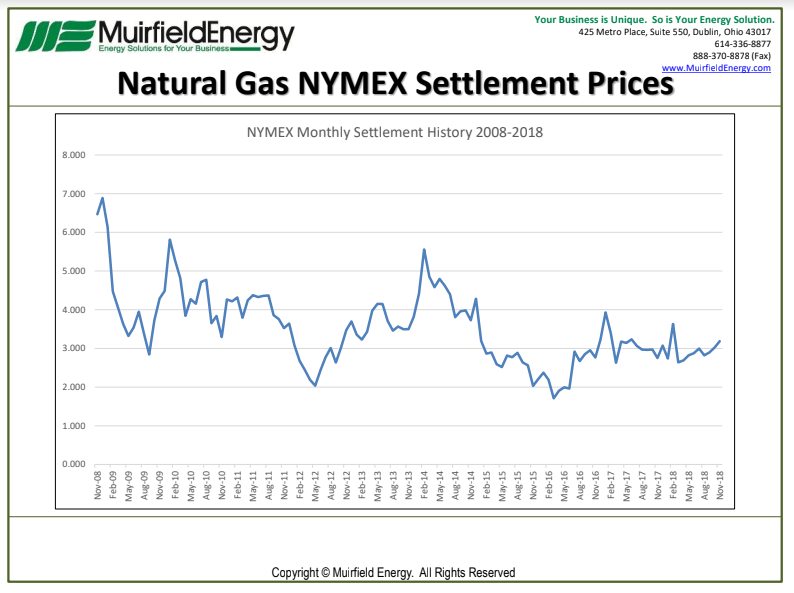 Natural gas storage levels at this same time last year are down 17% versus the five year average, and down 16% compared to this time last year. 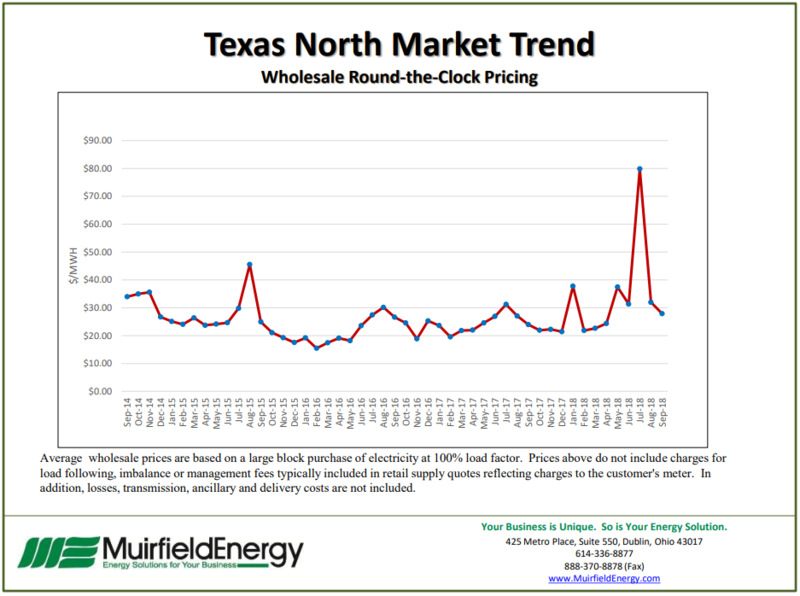 Another reason to consider renewal pricing is because of natural gas futures prices. 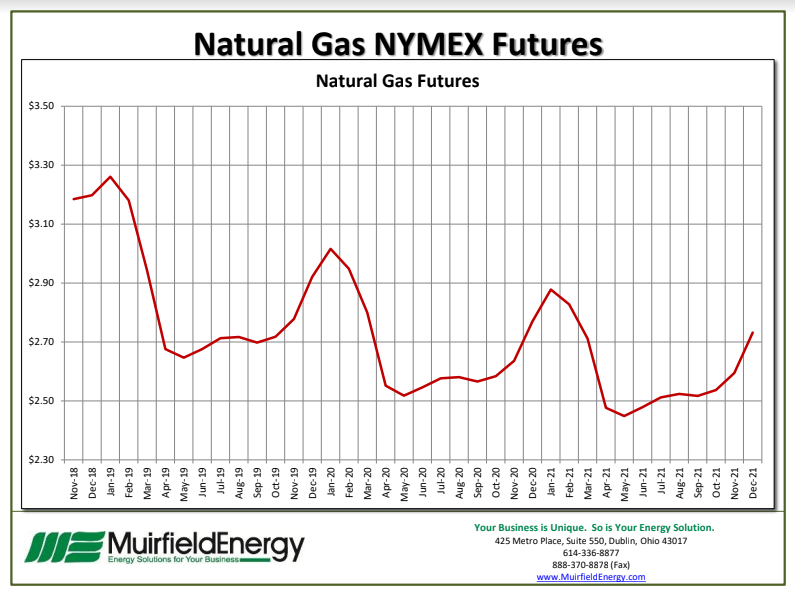 As of October 26th, natural gas futures for November 2018 contracts rose 6.4% this month, and are still trading at over $3.00. If you would like a no obligation price quote for an electric and/or natural gas supply agreement, we will gladly help to provide you with pricing. 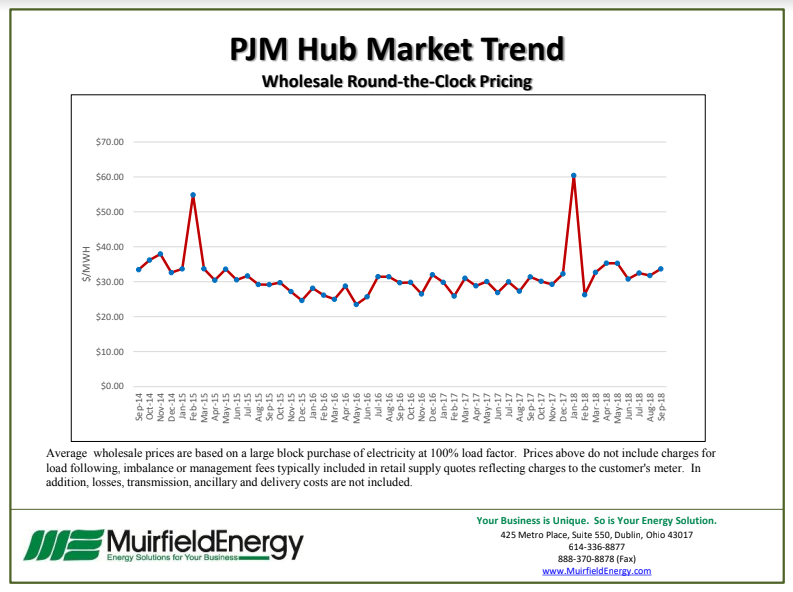 You can contact Muirfield Energy’s Corporate Office at 888-370-8898. We will have one of our local energy consultants speak to you. Thank you for watching the Monthly Minute with Muirfield. Have a great day, and we’ll see you next month.